Hey folks, this is just a quick post to update you about some plans l have for this site in the New Year. I want to take this blog and other projects like Linux Outlaws on to bigger and better things this year. I should start with a little of back story for anyone who doesn’t know. I started this blog a little under 2 years ago without any particular agenda other than talking about open source, my life in general and how it all fits together. I have to confess it was my first ever blogging experience and yeah I know I was very late to the game but things have grown and changed a lot since then. It’s become soley about open source and not a personal blog in the traditional sense, I’m fine with that. In the last 2 years I’ve managed to do some amazing things, most of them completely unexpected. 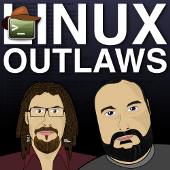 The Linux Outlaws podcast started on a whim and became popular which was all a fabulous accident but has allowed me to meet and chat some real open source celebrities, the kind of people I’d only previously read about. That’s a massive buzz obviously and I still have to pinch myself often. Sometime towards the end of 2007 I also started writing pretty long reviews of Linux distributions as I hopped around and tried different things. For some reason people seemed to like them and soon I was being listed on Distrowatch, Tuxmachines and countless other places, I’ve been really lucky. That in turn led to offers of paid writing work which I have loved and been very privileged to do. So that’s the plan in the next few weeks, there’ll be some major changes here I hope. It may take a while to achieve all this and I’ll keep the blog going here while I move. I’ll also redirect the Feedburner feed and direct people to the new domain so I hope there will be no distuption in service. Blogger has served me well and I’ve been happy with it but I think an open source platform like WordPress is more appropriate for a site of this kind. I don’t comment on blogs much these days but I do read every post your write. All I can say is, keep up the good work as usual! Sounds like a good idea, I’d say. I am personally more into Drupal, but I use WP for some of my sites – including the family site. My wife likes the easy editing, even if it has been a bit puzzling with the changes to the backend. I’ll probably convert literatelifestyle.net and technographer.net to Drupal 6 sites before long.